One lucky research assistant caught a rare show in the Straits of Gibraltar last week, as a fin whale was spotted breaching the water three times in a row, right in front of her. While fin whales do sometimes breach, it's rarely seen and even more rarely caught on camera. The videographer, Séréna, is a summer research assistant with CIRCE, a Spain-based cetacean conservation, research, and education organization. 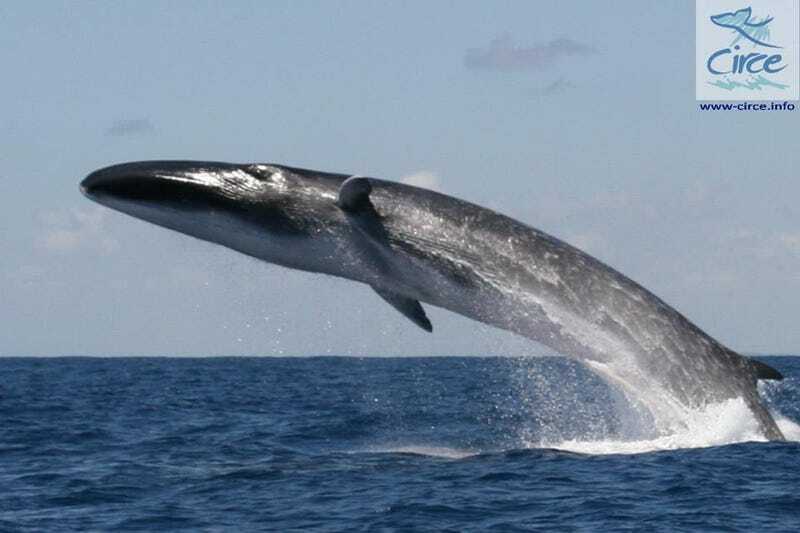 Fin whales (Balaenoptera physalus) are the second largest creatures on our planet, just after blue whales. When you consider that the average fin whale needs to hurl its 80+ tons and 89+ feet out of the water and into the air, the spectacle becomes even more amazing. As one of the fastest whales in the world, the fin can reach cruising speeds of 23 mph with short bursts up to 29 mph. (The Sei whale may beat it for short sprints up t0 40mph, but not for cruising speed.) Their impressive speed has given Fin whales the nickname "greyhounds of the deep."